On An Overgrown Path: Is Mahler's Ninth Symphony an enjoyable experience? Is Mahler's Ninth Symphony an enjoyable experience? Facebook scandals are now a daily occurence and yesterday's centred on allegations that the social network restricts the breadth of news feeds. The allegations, which have substance, prompted an explanation from Ramya Sethuraman, a product manager at Facebook, that their algorithms filter newsfeed content because “The goal of News Feed is to show you the posts that matter to you so that you have an enjoyable experience". Which given the pivotal role of Facebook and other social media in shaping people's worldview - 43% of US adults source news from Facebook - raises the important question of is there not more to life than enjoyable experiences? Having our culture shaped by algorithms coded by a bunch of nerds in Menlo Park to deliver "an enjoyable experience" is obviously very undesirable. For instance, are those closing minutes of Mahler's Ninth Symphony which leave the listener hovering miraculously between hope and anguish an enjoyable experience? I contend that no sensitive mortal can judge the journey taken by Mahler in the symphony enjoyable. But I also contend that no sensitive mortal should live without experiencing the symphony. But in the dystopian near-future when we all live in social media controlled filter bubbles, will we be allowed to experience Mahler's great symphony, or other artworks that fail to meet the 'enjoyable experience' criteria? In the final minutes of Mahler's Ninth Symphony the polarities of hope and desperation are fused into a single disturbing beauty. There are many notable recordings of the symphony in my library; notably those by Bruno Maderna and Bruno Walter. But for me Mahler's musical alchemy is best expressed in Sir John Barbirolli's recording of the symphony for EMI. So at this point I will let Barbirolli's biographer Michael Kennedy take up the story. A greater triumph awaited [Barbirolli] in January 1963 when he conducted Mahler's Ninth Symphony. Mahler was not often played in Berlin, and the [Berlin Philharmonic] orchestra frankly confess that they did not particularly like his music - 'but,' said one of the principals, 'Sir John made us love it as much as he did himself and we played it as he wanted.' So well, indeed, that a leading Berlin critic wrote: 'Not since Furtwängler have we heard such human warmth and soul combined with superb musicianship'. The orchestra themselves asked that Barbirolli should record the symphony with them, the first English conductor to record with the Berlin Philharmonic since Beecham in 1937. During the cold January of 1964 this famous recording was made in the Jesus-Christuskirche, in the suburb of Dahlem. "Not since Furtwängler have we heard such... superb musicianship" is high praise indeed, but it is justified. On my copy of the original 1989 CD transfer the superb musicianship of Barbirolli and his Berlin players is complemented by quite superb sound, for which credit must go to EMI staff producer Robert Kinloch Anderson and an unknown balance engineer. When auditioned on a high-end audio system the sound has that intangible sonic ground that is lacking in so many recent recordings. Digital technology is usually blamed for the audible differences between analogue and modern recording, but the impact of changes in the front end of the recording chain where the signal is still in the analogue domain - microphones and line input amplifiers - is invariably overlooked. Modern microphones sound appreciably different to gold standards of the past such as the Neumann U67 and U47. But whether modern microphones sound 'better' or 'worse' is, like so much in the black art of recording, a subjective judgement. 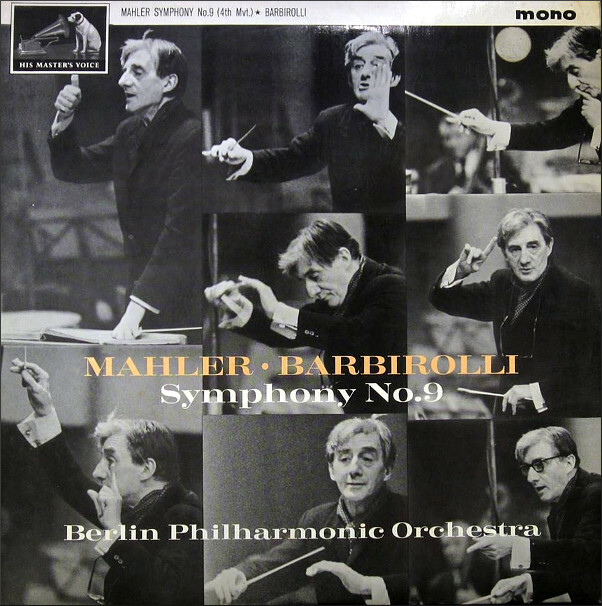 The CD of Sir John Barbirolli's Berlin Mahler Ninth is still available. So hurry and buy it before the pervasive tastemaking algorithms bury it alive beneath layers of more enjoyable but infinitely less rewarding musical experiences. I have to admit that the 1938 Bruno Walter and Vienna Philharmonic performance of S9 stands out in my mind as one of the best, not the least because of its historical significance. But listening to the Barbirolli/ Berlin Philharmonic is an altogether different experience. Thank you for featuring it in this entry. I also think it could very well be the best recording of S9.